This week Laleham Gap school teacher Paul Ursell opened a special communication from Canada. It was a personal message from one of the world’s most famous astronauts, Chris Hadfield, personally written on large photo. 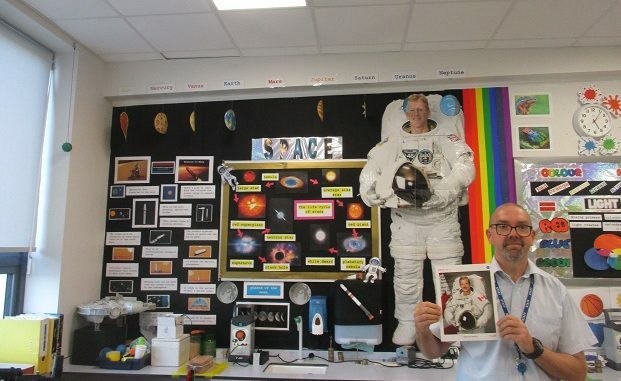 Mr Ursell, who teaches some science at Laleham Gap, had been in contact with Chris Hadfield and his team to tell him how importantly the school took inspiring their students about science and ‘cheekily’ tried to get Chris to come and speak to his pupils. Chris hasn’t ruled this out but he is in demand so it could be many years before any realistic opportunity might arise. Howeve,r he was so impressed he wrote the school a personal message to inspire the students. Mr Ursell said: “ I am really pleased. It is great for the science we do at this school to be recognised in this way. And I totally agree with Chris. I think it is really important for our pupils to be inspired, to see the potential in science, to reach high and to see that many of the things that we think limit us can often be overcome. The personal message from Chris arrived at the school in the middle of world space Week 2018! As well as his 5 months on the International Space Station in 2012, Chris docked a Space Shuttle with the Russian Space Station MIR in 1995, performed spacewalks and even commanded the International Space Station. With nearly one million followers he returned to Earth as a legendary astronaut. On his longest mission he carried out over 100 crucial scientific experiments. Well done to Chris Hadfield for taking the time to write to my pupils.